Patrick is registered Kinesiologist, Reflexologist, Nutritional Counsellor and Reiki Practitioner. He has studied at the Kinesiology Institute, the Almetra School of Reflexology and the Irish Institute of Nutrition and Health. Post graduate studies include studying under International Chiropractor and Kinesiologist Sheldon Deal DC and International Kinesiologist and Wellness instructor Wayne Topping of the Topping International Institute and Kinesiologist Professor Steven Rochlitz USA. He has completed his teacher training in Maynooth College and is a qualified Touch for Health Instructor. 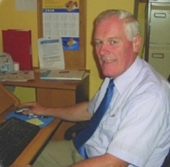 Pat has lectured at O’Fiaich College on Kinesiology for a number of years and runs a very successful Health Clinic in Dunleer for over 20 years. Sheila qualified in 1991 at the Almetra School of Reflexology. She then started into private practice. She treated cancer patients in Our Lourdes hospital Drogheda, and has conducted 10 week courses in Reflexology in the VEC College in Drogheda. She was an assistant Tutor with the Footprints School of Reflexogy before opening her own school of Reflexogy in 1996. Each year Sheila completes a Diploma course with students with a success rate of 95%. She lectured on reflexology in O'Fiaich College in Dundalk as part of a diploma course in complementary health. She also qualified as an examiner of other schools of reflexology and gave training days for guidelines for new examiners requested by the Irish Reflexologists institute. She completed her teacher training in Maynooth College and continues to see people privately for reflexology treatments.